This page describes the discussions and requirements for the meta-model of JWT. Based on the existing meta-model of AgilPro we will summarize all wishes, extensions etc. on this page. An important part is JWT metamodel's extensibility. This document File:AgilPro MetamodelDescription.pdf describes the metamodel of AgilPro as it is today (2007-02-21). This document will be the basis for discussions on all working groups who have requirements on the meta-model. A comparison with other meta-models as a result of an evaluation can be found in the following document: File:EvaluationExistingMetamodels.pdf. The document File:AgilPro Metamodel.pdf describes an initial revision of the document comparing the JWT/AgilPro metamodel with the XPDL 1.0 schema. It covers all the XPDL elements as well as the Bonita engine vendor specific extensions. Please find under File:Comparison JWT BPMN v0 3.pdf a document describing the differences between the JWT Metamodel on the one hand and BPMN on the other. Imixs specific Action features support : Ralph Soika, of Imixs.org ; see information about the current IX Workflow Modeler at http://www.imixs.org/websites/imixs-org.nsf/chapter/3000.0030. Being able to store BPMN information that can't be mapped to JWT. This allows then to manipulate this information in JWT, but also to provide a perfectly bijective JWT2BPMN reverse transformation (notional "pivotal" metamodels). Marc : more generally, transformations to and from other models have the same kind of requirements. Hooks (as well as other Action-level features) should be stored in a Bonita specific metamodel extension. This extension should be typed so Bonita-specific UI extensions would know which metamodel extension they have to manage. This extension should be editable in a custom-built UI view. This extension's information should be translated to Bonita XPDL in the right format (using XPDL ExtendedAttributes mainly). the Action-originated event (ready, start, beforeEnd, end, cancel, pause, resume...) it is hooked on. Note that a hook may be hooked on many events, which is the same that saying that there may be several identical hooks hooked on different events, since hooks are stateless. the Java Hook class it calls when triggered. This class must implement the corresponding interface (NodeHookI, which has one method for each event). Requires to store and manage information pertaining to these specific Actions / Application or Action / Application extensions. WSDL definition and deployment information. A single service URL that also provides the WSDL by appending "?wsdl" to it is enough. Alternatively could be explicitely provided the WSDL, the service, the portTyp, the location in optional "overriding" properties. NB. this may be implemented in any given way at runtime, including on top of middleware technologies such as SCA. In this case, additional information required by the runtime implementation must be provided in a specific extension. SCA service Java interface. Ideally this should be guessed at runtime. NB. the runtime engine must be integrated in an SCA architecture, typically by being configured to load at startup the appropriate SCA composite files. Note that the alternative of specifying in JWT a specific SCA composite file to instanciate at runtime is not a good SOA practice since it explodes the engine node's SCA architecture ; however it is interesting in a technical point of view, for example to implement calls made by other applications. like WebService calls. SCA binding type. For a WebServiceApplication, must be "ws". NB. these information could be provided in an extension to a given WebServiceApplication instance, or to an extension to Activity (i.e. process) that configures its runtime platform. This is the equivalent of EMFT MWE's Bryan Hunt's WorkflowComponent concept. JWT users should be able to define custom Actions with custom metamodels, that might be exploited at runtime. Marc : I link this with the "black box Action" point of view, where Actions are merely linked blank "do something" slates that users implement at will ; this is similar to jBoss and Bull's PVM generic process engine, and somehow to Windows Workflow Foundation. Such an extension is actually a JWT Action's implementation. This implies there can only be one such extension per ActivityNode, though nothing says they themselves can't be extended somehow. In its concept, it is similar to a custom extension of JWT Application that is inlined (embedded) within an Action. Imixs.org features depend on numerous Action-level properties that should be stored and accessible in JWT metamodel, and editable typically through an additional property tab(s). Such an extension is actually an additional, activable feature that is available on any JWT Action, that provides new functionality not related to the Action's actual implementation (i.e. what it does). For instance, it could as well apply to an Action that calls a web service, as to an Action that asks information to the user as event to a Join node. See Florian Lautenbacher's requirements at https://bugs.eclipse.org/bugs/show_bug.cgi?id=225704 . See Christian Saad's contribution proposition in the mailing list. It uses a single static Property type and an additional external metamodel to control the behaviour of the typed properties (when and where to create them, version etc.). static, "fixed" extension model done in static EMF (loaded as instances of JET-generated classes). Those classes must be available to JWT and specified in the workflow file. STP-IM -like properties are in this case. Christian Saad's proposition for the "dynamic properties" requirement also, but in order to control their semantics and behaviour, uses an additional metamodel that must be provided in workflow model, in workflow bundle, in autodiscovery directory or in plugin.xml. custom designed extension model done with static EMF (loaded as instances of JET-generated classes). Requires the extension developer to generate classes using a .genmodel file. Those classes must be available to JWT and specified in the workflow file. custom designed extension model done with dynamic EMF (loaded as instances of DynamicEObjectImpl). Ecore schema must be specified in schemaLocation and available there, or if loading is customized in workflow bundle, in autodiscovery directory or in plugin.xml. custom designed extension model done with XML following user-defined xsd schemas, loaded as EMF / XML using through XSDEcoreBuilder. XSD schema must be specified in schemaLocation and available there, or if loading is customized in workflow bundle, autodiscovery directory or in plugin.xml. Alternatively but at the risk of lowering the typing of the whole model, any XML (without schema) could be allowed and loaded EMF / XML AnyTypeImpl. Alternatively, loading could be done not by base EMF but delegated to a custom EMF XMLHandler or even any non-EMF parser ; Imixs.org's Ralph Soika proposal follows this, and alternatively suggests that a model's extension content could even live in its own file. No metamodel extension has to be defined. However there is no proper typing ; therefore property names are to be well managed so properties created by different extension vendors don't conflict with each other. Benefits from the full expressivity of Ecore metamodeling. The dynamic EMF technology is especially interesting, because it blends ease of use (no code to write or generate) with power ; therefore we'll especially consider it in our analysis from now on. What parts of the model are interesting to be extended ? actually, any model element could be interesting to put Vendor specific information on. Therefore we'll try to stay as open as possible on the topic of what is extensible. performances. Dynamic EMF and mixed static - dynamic EMF models are slower to load, in proportion to the amount of dynamic EMF within. Most extensions will be small and sparse, and therefore performances will stay OK. If not, it is up to the extension vendor to choose static EMF for his extension in order to provide better performances. Diagram - graph - GEF manipulations. We choose to evacuate this problem by not letting extensions be displayed or handled in any way in the diagram GEF editor. Manipulating them in a generic or vendor specific view is enough. Note that displaying them in GEF is still possible if the right GEF code is written - but that is more than a mere extension. In the specific case of Action, Directly extending JWT Action is only possible using static EMF, because it may contain static subelements (Location, Size). So it is possible, but not the most useful. Anyway it is more akin to modifying the core JWT model than to writing an extension (I think), so we won't talk about this possibility here. However this still implies that EMF extensions should be put in their own subelement, meaning Action (or other extensible model elements) should have a containment relation to extensions. There is a common concept that is philosophically close to our needs (anything extensible, extension in their own subelements) : the concept of "Aspect" (or mixin etc.). An Aspect can be viewed as a "part of a type" designed to answer or implement a well-defined business or technical need. Therefore I'll use the term of Aspect when speaking of typed extensions from now on. Finally, EMF extensibility could also provide a simple extension alternative thanks to a base PropertiesAspectTemplate that has only to be extended. Here is a list of changes to the JWT model that are possible to implement said features. we can't directly extend JWT Action, because it contains static subelements (Location, Size) and therefore can not have Dynamic EMF extensions. Therefore every extensions are put in their own subelement (below the "aspects" relation). typing it with EObject makes it more powerful and easier to extend. However it does not take advantage of typing, allows "illegal" models (ex. adding a DataType as aspect...). as a better alternative, it can be typed with a new Aspect class. In this case, we also create an Aspect class. Either Aspect is a static non abstract class, or a dynamic interface. The second is better because Aspect implementations will be loaded as DynamicEObjectImpl and not AspectImpl, and therefore fully dynamic ; but at the same time it forbids static EMF Aspect implementations. the goal of PropertiesAspectTemplate is to make simple extensions (i.e. property map like) trivial. 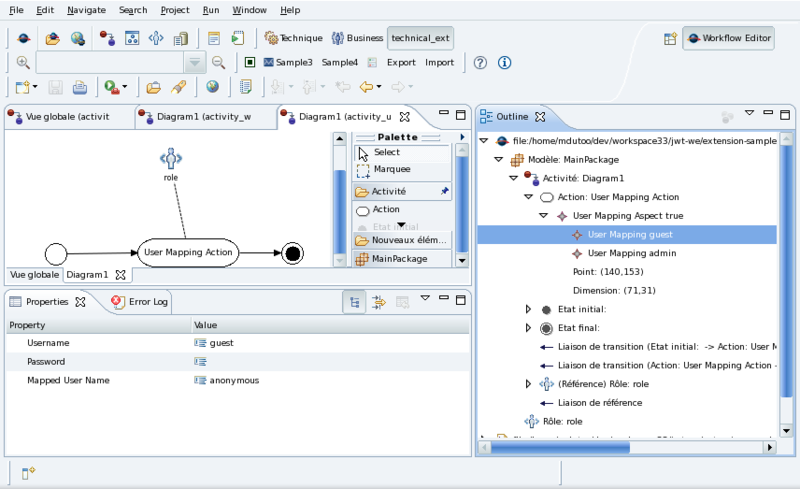 It is an abstract dynamic object that has only to be extended by the user to create a custom property map aspect. pros : allows to use Dynamic EMF (else not DynamicEObjectImpl) ; but maybe a DynamicAspectEObjectImpl could be written ? cons : the outline > new child feature can't be used out of the box anymore, because all children are added as aspects (and not profiles, nodes...) ; but maybe relations (at least aspects) could be made visible there ? These samples showcase the mixed static and dynamic EMF technology, thanks to a JWT metamodel with an EObject-typed "aspects" relation on ModelElement (or Action). To be loaded in JWT, it also requires some magic in WEEditor.createModel(). xmlOptions.setProcessSchemaLocations(true); // not required, works also with false ?! r.getDefaultSaveOptions().put(XMLResource.OPTION_SCHEMA_LOCATION, Boolean.TRUE); // REQUIRED else no xsi:schemaLocation after save ! Here we define a LogAspect extension meant to provide an Action with additional information (messageFormat and logProtocol attributes) about how it might be logged at runtime. Adding this aspect to an action (or its application) specifies a runtime invocation of the given web service. Note that there will be two different ways to invoke a service : either explicitly calling a web service using this aspect, or calling a generic service and also specifying its binding (web service, rmi, xml / rest...) by using another aspect InvokeServiceAspect and runtime infrastructure provided by the friend SCOrWare project. This sample showcases a more complex aspect. UserMappingAspect's purpose is to allow to provide to an action (or its application) more specific user mappings than those defined globally at workflow level. It is useful when all applications executed by a workflow are not using the same user directory as the workflow engine ; in this case, applications that require specific credentials will use this aspect to provide them. The UserMappingAspect contains several UserMappings, each specifying how a given runtime user (i.e. a user known within the workflow engine) is mapped to different credentials when talking to the application, which has to exploit this data on its own. Or : how should the JWT Workflow Editor behave in the case of metamodel extensions ? Now that we've got a basic idea of how it could work at model level, let's focus on what is its first use : display and edition in JWT WE. As said before, we prioritize manipulating metamodel extensions in a generic (i.e. JWT outline and property view) or vendor specific view. It is enough and evacuates GEF diagram extension complexities. We will here focus on what JWT WE itself provides : the JWT outline and property views, and how it should best behave in the case of metamodel extensions. NB. What is possible with extensions should be as much as possible specified in the ecore metamodel, since not only will it improve what features the generated EMF editors provide by default, but it will also prevent any illegal, non-conforming workflow model. However we obviously won't limit features to what EMF provides. So these needs could be additionally implemented through an additional behaviour metamodel, adapted or custom UI code or UI code generation - or even through ecore customization (see http://www.ibm.com/developerworks/opensource/library/os-eclipse-emfmetamodel/ ) though it would be hard to maintain and not agile enough. How do we want extensions / Aspects to behave in the Workflow Editor ? "single" and / or "unique" : to limit instanciation of an aspect of a given type to at most one, or exactly one (i.e. pre-instanciated). Useful for all aspects that model "activable features". (optional) "undeletable" and / or "readonly" : to forbid deleting it (or require it to be instanciated again). solution 1 : by configuring those features in "special" properties of Aspects, like "singleton", "removable". For example, EMF / XML uses such special properties (ex. "xmlns:prefix"). However, these properties configure how the behaviour of the Aspect type (how it is instanciated etc. ), and not of each of the Aspect instances, and therefore are not at the appropriate conceptual level, which complexifies their understanding. solution 2 : modify ecore genmodel to store these information at the right conceptual level, and the EMF ecore JET templates to exploit them at generation time. However besides being difficult to do and maintain, it has not the level of flexibility we need : supporting new Aspect behaviours by adding new information there would be just as costly. solution 3 : using a custom "metametamodel", that would also be in line with future jwt-views management, like Christian Saad advocates. Developing it in EMF would the development of an editor, while still allowing to package it in different ways : standalone, in a plugin.xml extension, or even bundled within a .workflow. other custom rules required by the extension developer would however require coding : either by implementing them in their own custom view UI, or by modifying EMF-generated code or generation templates (EMF.edit's ItemProviders), or even palette ? policies ?? basis (works !) : Making it visible in the (outline) UI ! How : in Views.displayObject(), display by default (opposite of current behaviour), so model objects that are not specified in the view will be displayed. This is good behaviour, because, all default model elements will be specified in the view, and it is still possible to specify not to display one by setting it to false (unchecking its checkbox in jwt-view). About extension loading among the various files, EMF has nice out of the box features. An XMI file that refers relatively to an available ecore extension file will load as dynamic EMF. If XML rather than XMI is used, EMF can be configured so an XMI file that refers relatively to an available XSD extension file will load as EMF / XML (thanks to XSDEcoreBuilder). And EMF can be configured to load unknown extensions as XML without schema (concretely, the EObject implementation is AnyTypeImpl), though it is of little use since it is not typed. However this is not enough. the end user must be able to provide them in a simple way, like a standard directory whose ecores will be loaded at WE startup (csaad) ; and another way to add one from the editor UI, like a button "add extension model" allowing to choose an ecore file. vendors will want to be able to have a more built-in way to provide their ecore extensions, like a path in a plugin jar, if necessary referred to in their plugin.xml . Extension versioning : it requires a naming and versioning mechanism for extensions (a list of which must be centrally stored in the model file, e.g. in the model-element) to ensure compatibility. See proposition of Christian Saad for custom typed properties. Note that Model is already versioned. Model update algorithm : it should be modified so it can make the difference between model version error and extension version error (including unknown extension). Note that it is for now limited to the "addition only" changes in the ecore, which is enough.